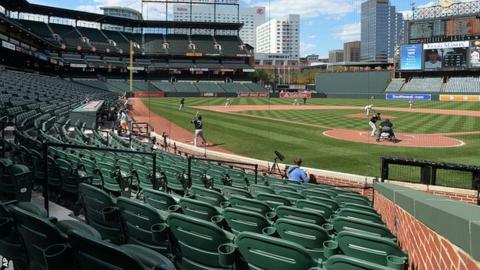 Fans were locked out of Baltimore Orioles' game against Chicago White Sox following violent protests in the city. Protesters have been on the the streets since Freddie Gray's death on 19 April - a week after a police encounter where he sustained unexplained injuries. Shops have been looted and objects thrown at police, injuring several officers. It was the first time in the history of professional baseball that fans had been locked out of a game. The game at Camden Yards started at 14:05 EDT due to the city's 22:00 curfew in the wake of the riots, with Baltimore winning 8-2. Among the few able to witness the match were those who had paid for balcony rooms in the nearby Hilton Hotel, which overlooks the stadium. Journalists accredited to cover the game reported that the voices of players on the infield could be heard clearly. "Attention media: For record-keeping purposes, today's official paid attendance is ... zero," an announcement made over the press box public address system said. Other reports said the stadium still played the traditional US baseball anthem - Take Me Out To The Ballgame - during the traditional seventh-inning stretch. The Orioles and Major League Baseball officials had said the decision to shut out fans had been taken for safety reasons. But Brendan Hurson, one of the 40 spectators gathered by a fence near the stadium's main gate, said it was a missed opportunity and held up a sign reading "Don't forget Freddie Gray". Six police officers have been suspended following Gray's death and an internal investigation is under way. On Sunday, more than 1,000 protesters were on the streets of Baltimore and at least 12 arrests made. Gray, who was 25, is the latest of a series of black Americans to die in police custody in recent months, triggering angry protests accusing the police of brutality.